You know the headlines, you know the bustouts, you saw what happened on TV. But there were many untold and unexplored stories of the 2016 World Series of Poker Main Event final table, so we decided to break some down and crunch some numbers. -45: Average temperature in the regions of Antarctica inhabited by polar bears. The bears are built for the cold, which is perhaps why Kenny Halleart’s rail chose to have someone dress as one to cheer their friend on at the notoriously cold Rio. 4: Number of players lost on the first day of November Nine play. While the plan was originally to play from nine down to six, the producers and tournament staff elected to play a little longer, perhaps because it did not take long to lose three players and, as a result, the table did not get far along in the structure. Because of the extended play, Halleart exited in sixth place on the first day of action. Then, on the second day of play, the table played three-handed for a little while because it took so little time to get from five players to three. 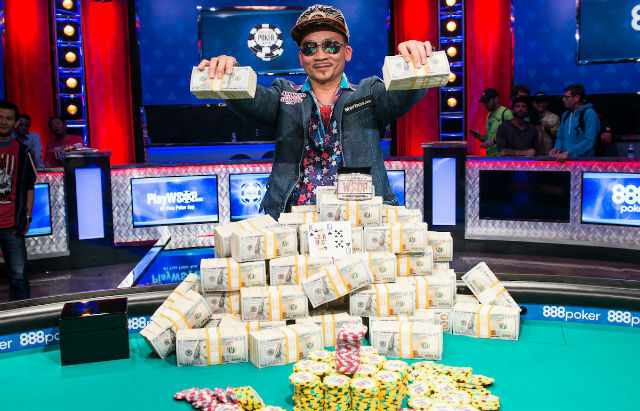 9: Number of years since an Asian player has won the WSOP Main Event. Laos-born Jerry Yang won in 2007, but since then the list of winners has been exclusively Caucasian and exclusively under the age of 30. Nguyen, who is 39, bucked both trends. 16: Number of hands it took before losing a player. Fernando Pons didn’t quite make it twice around the table before exiting in ninth place. 58: Number of hands it took at the final table before Griffin Benger managed to win a pot. The Canadian struggled at the final table and blinded off much of his stack. He also failed to flop much of anything, resulting in the very long stretch without dragging chips in his direction. The celebration was short-lived though. He busted in seventh place nine hands later. 60: Going rate in dollars for four pints of ice cream from the boutique Tin Pot Creamery, a Palo Alto ice cream provider Gordon Vayo promoted with a patch at the final table. Boasting flavors like Earl Grey and Sweet Barbeque, the creamery produces small batches of ice cream at quite the price, which also doesn’t include tax or shipping and handling. 69: Starting bid on eBay for the New Era brand Rocket Raccoon ball cap similar to the one wore by Qui Nguyen throughout the final table. The Guardians of the Galaxy hat was one of the more memorable pieces of headgear in Main Event memory. Now the hat is difficult to come by, but that is largely because of the popularity of the now two-year-old movie as opposed to Nguyen’s ability to influence style. 182: Number of hands heads-up play lasted. It is also the number of hands it took for the final table to get from nine down to two players. By comparison, last year the entire final table took 184 hands, with Joe McKeehen besting Josh Beckley after 13 hands. 1,046,965: Difference between $4.5 million and what Cliff Josephy collected for finishing in third place. Much has been made of the fact Josephy staked Joe Cada when he won the 2009 WSOP Main Event. Though the number was never confirmed, most assume Josephy took home half the $9 million payday. If that is the case, turns out this wasn’t his most profitable WSOP Main Event after all.